Governor Adams Oshiomhole of Edo State in Nigeria has predicted a hell of existence for Nigerians, no matter the party that wins the forthcoming presidential election in February 2015. The governor's judgement is based on the current level of exchange between the Nigerian Naira and the American Dollar. According to him, this has been caused by the country's inability to save for the raining day. "Already, as low as N180 per dollar and I believe by February when the elections are over, nobody is going to want to hold the Naira. Wherever the election goes, I expect the Naira will hit over N200 per dollar. The inflationary consequences of that is prices of everything will go up and part of the vicious cycle of the devalued Naira in the manner that is being done is that the price of petroleum products imported in dollars will go up in Naira and government will be asking people who are already poor to pay more money for petroleum products," the governor said in a report published by the Premium Times. Although, the governor tried to put the fault on what he called the whereabouts of excess crude fund unaccounted, and inability of the current government to save to curb the hardship from unexpected fall in the prices of oil. But the end result was that he said nothing will save Nigerians from coming economic Armageddon, irrespective of which party wins the presidential election. Nigerians are currently preparing for the presidential election and election in the senate, the House of Representatives and state assemblies. The ruling party, People Democratic Party and a major opposition are party are struggling for control. The opposition party has done all it could to paint the current government as incapable of ruling and curb corruption. The incumbent president has said he needs more time to consolidate his achievement. The opposition is drumming a need for change and that it will fight corruption and make Nigerians realize the benefits of democracy. But now that one of the governors of the opposition party says that whichever party wins, Nigeria heads toward economic hell, many Nigerians will ask a question about why is the opposition promising a change it knows it is impossible to fulfill in view of the foreseeable economic situation. One Nigerian interviewed said he heard that a change was on the way, and that It is confusing to hear that a member of the opposition is saying there will be nothing his party can do to ameliorate the suffering it claims Nigerians are experiencing if it comes into power. Oshiomhole was one of the governors in the APC who was highly favored to be considered for the position of the party's vice- presidential candidate, the issue of Moslem/Moslem as president and vice-president having sidelined Governor Fashola of Lagos State. As at the last moment the party decided on a Bola Tinubu favored candidate, the governors' group in the opposition pressed for one of them to be picked as the vice presidential candidate. It was itself a political Tsunami that the governors were sidelined and a relatively unknown figure picked instead. 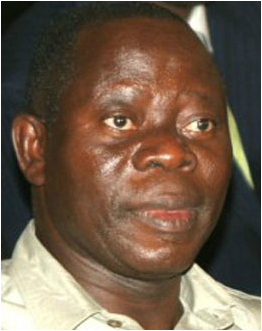 In the current picture of development, some observers see Oshiomhole's statement of a political Tsunami, irrespective of which of the parties that wins the presidential election, as a political machination targeted indirectly to disaffection and systematic withdrawal of total support for the opposition's victory in the coming election.